Summer being pick right now around me, I am always feeling thirsty and always looking for something cool. During summer, I don't feel like eating anything, but just to drink something cool. Litchi being my one of the favorite fruit in summer, I always bring a big bunch whenever I go for shopping, even my kids love them. After plucking and eating them from the branches, I decided to make some popsicle. To add some color to my popsicle, I decided to make them bi-color, by including papaya in my popsicle. Both the fruits are very healthy and tasty and a must have during summer. 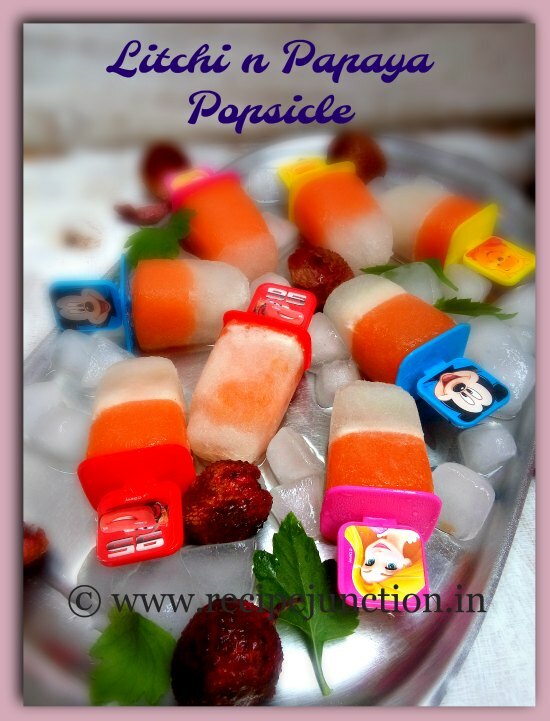 Now let's see how you can make this Litchi n papaya popsicle in no time. 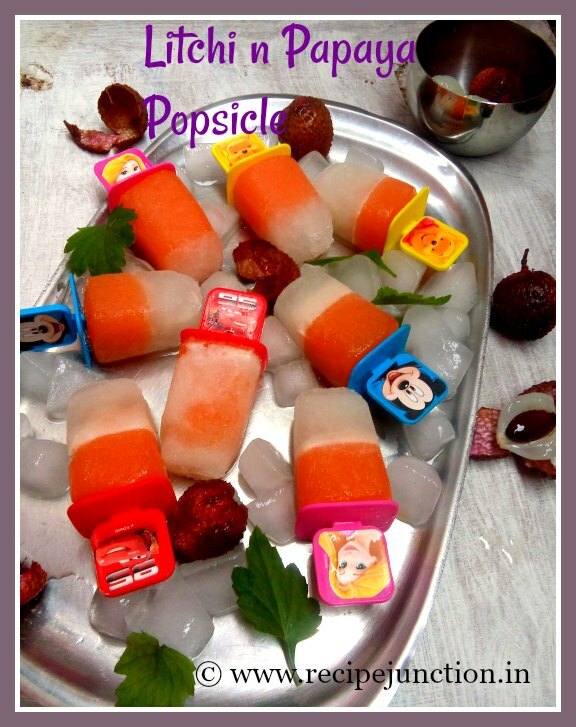 You can make popsicle from any fruit juice during summer season, specially which fruit your kid don't like, make it in popsicle form and they'll love it. First, take cubed papaya, 1 and 1/2 tblsp. sugar and 1 tsp. lemon juice in a blender and blend till smooth without adding any water. when done, remove in a bowl and mix a little water (~1/2 cup) into it just to thin up the papaya pulp. Next, wash the same blender and add litchi pieces in there. Add 1/2 to 1 tblsp. sugar and 1 tsp. lemon juice in it and adding a little amount of water, blend till smooth. For Litchi, you have to strain the juice. Collect the juice and keep aside. You can liquidise the juice a bit, if you want. How to prepare the popsicle mould :: Take your popsicle mould, first add the Litchi juice upto 1/2 of the mould and put the mould into freezer for 1/2 an hour to 1 hour till the litchi juice sets a bit. 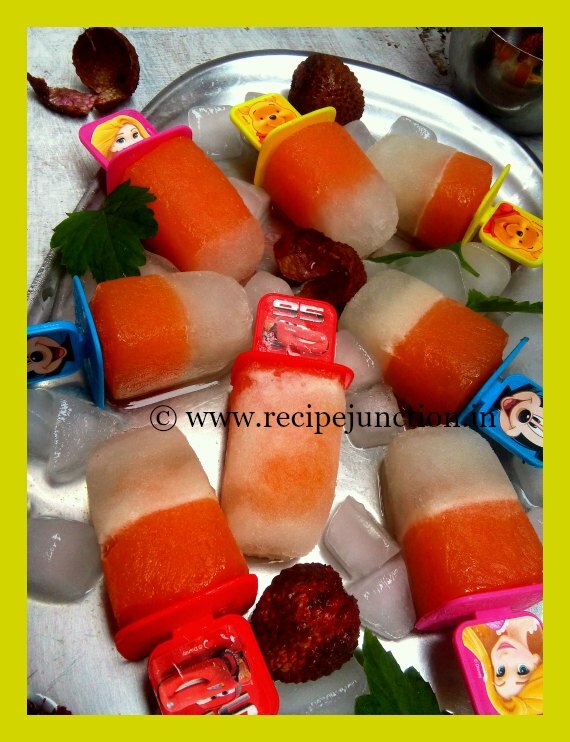 Then pour the papaya juice over the litchi juice and put the popsicle stick over it and put in the freezer to set it completely.It may take 6 to 8 hours to set completely. 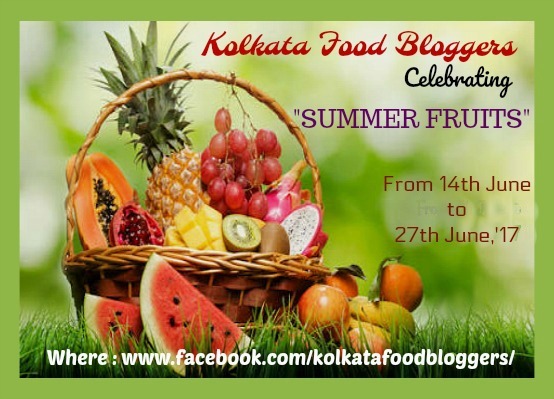 Sending this summer treat to Kolkata Food Bloggers' ongoing event," Summer Fruit" .